Brian Hunter born and raised in Tallahassee, Florida formed Hunter General Contractors, LLC in Orlando, Florida in 2008 with the philosophy of building quality projects on time and within budget. Hunter General Contractors is a Florida Minority Owned Limited Liability Company as well as a licensed State of Florida Certified General Contractor ( CGC1517033 ). 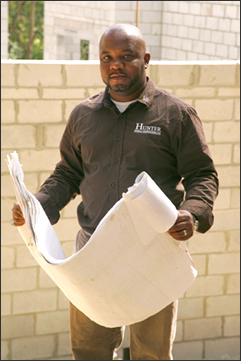 Hunter is a graduate of Florida Agricultural and Mechanical University ( FAMU ) with a Bachelor of Science degree in Construction Engineering Technology and 22 years of experience in the construction industry. Hunter General Contractors, LLC is a full service General Contractor and Construction Management firm specializing in Primary and Higher Educational Facilities, Condominiums, Site Work and Civil Construction, Government, Public, and Private Sectors. Headquartered in Orlando, Florida, Hunter General Contractors also has a branch office in Tallahassee, Florida to better serve other areas throughout the state. At Hunter, we are committed to achieving the very best results in terms of quality, timeliness, and cost effectiveness for your project. We have positioned the company to assist other General Contractors in meeting their minority compliance commitments or partnering with a professional and experience minority firm when needed. We supply a highly skilled and highly reliable staff as needed to support small residential, civil, or commercial projects. Our aggressive work ethic, flexibility, and willingness to go the extra mile have earned us a considerable amount of respect within the industry. We know that the demands and requirements of our clients are unique. That’s why we aim to form alliances for the future. At Hunter, we don’t just build, we build relationships. We ask that you consider Hunter for building, expanding, or renovating your next project. Orlando Business Journal April 2013.
for the year of 2013 by the Orlando Business Journal.